There is value in our Wyoming County Whitetail deer scents! Watch the client videos below and see for yourself! Our quality deer scents make a difference! All of the above videos were shot by Virgil Alexander from Texas, a loyal Wyoming County Whitetail scent user. Please check out the testimonials page for pics of deer taken by Virgil and his friends as well as detailed instructions on how he uses our scent with so much success. Virgil’s explanation of what is shown in the videos. “All of this video was shot on the same road over a 3-4 day hunt in 2005. The deer in one of the videos is a 4.5 year old 10 pt. You can see one of my tampons hanging in the tree in the upper right hand corner of the screen, this is where the buck entered the road from the brush line. This deer is about 20 yards away from me and I am just sitting on the ground. At the end of this video, the deer marks the territory with his pre-orbital glands (on the nose) and does a lazy scrape by peeing over his tarsal glands. The primary deer in another is a 7.5 year old, post mature 9 pt. You can’t see any tampons visible but they were all over the place as usual. There are a total of 4 bucks in this video. The youngest buck darted off into the brush and the other three quickly followed him in because they didn’t want him getting the jump on the mystery hot doe that they all had been smelling. They all soon returned to the road after realizing that it was a false alarm. That old buck gets 15 yards from me and once again I am just sitting on the ground. Two of the videos are of the same deer. 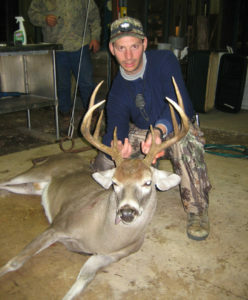 He is a 4.5 year old natural 11 pt. that scores mid-170. One video shows him when he first enters the road from the brush line. There is a (blurry) orange bottle hanging in a tree just behind where he enters the road. That bottle has Wyoming County Whitetail scent in it. He enters the road near the bottle, but between me and the bottle. Virgil is correct in stating that using a larger volume of urine gets better results. This is why we make sure our product is cheap enough when compared to other deer scent retailers that you can afford to buy a quart or gallon.